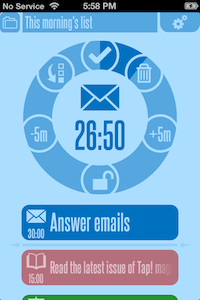 My new favourite app for beating procrastination is the 30/30 app from the good folks at binary hammer. I often find I get distracted from the list of things I have to do. With the 30/30 app, I can create a simple list of tasks, each with an amount of time to do them in. Once I start the list, the app shows me how much time I have to complete each item on the list. I can add if I want, or if I finish early, I can check it off (and the task moves down to the Completed section below the line). The result: I am better able to focus on the task list I have to do. The app works on the iPad and the iPhone. The interface is superb. And it’s free! I highly recommend it. This entry was posted in new! and tagged apps, ipad, iphone, productivity, tools. Bookmark the permalink. Looks cool, I used to use Things, but now I just use the reminders app now and just tick off my list. One major advantage with the default reminders app is I can access it on http://www.icloud.com and type on a real keyboard rather than the touch screen.